Improve your store. Increase your income. Continually improved since 2010, this sleek Joomla slider plugin has everything, including: swipe gestures on touch-screen devices; full-screen view; responsive design to automatically resize images to your page. People always pay attention to the moving objects. That's why slideshows are perfect for showing your top promotions and announcements. Use shortcodes to place slideshows wherever you want them. We do our best to improve Magic Slideshow. For 8 years already, our crew has been working to keep it compatible with all new WordPress versions. If it doesn't work immediately with your theme, our friendly support team will resolve it within 24 hours. Use one of the popular ready-made templates or customise one to look perfect on your website. Feel the power of customisation with 23 adjustable options like effects, thumbnails, bullets and animation speed. Create custom slideshows for any page, to get your site pumping like a piston. You'll obtain a unique shortcode for each slideshow, to easily insert into pages and posts. Use SEO-friendly image names to beat competitors in Google too. Download the Magic Slideshow component for Joomla content (free and fully functional demo version). Upload it via your Joomla admin panel Extensions > Extension Manager > Browse File > Click 'Upload & Install'. Component will automatically enable. Open article or any other content area where you want to show slideshow. Add a DIV with class of MagicSlideshow and put your images inside the div e.g. The Magic Slideshow CSS and JS files will automatically be included in the page head. 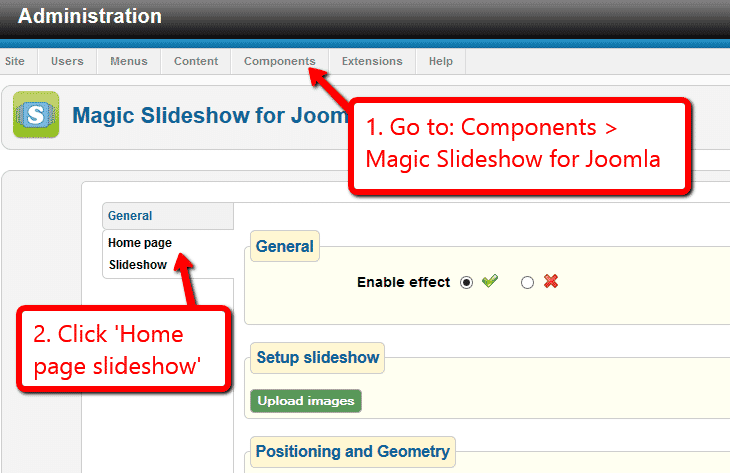 Go to Components > Magic Slideshow for Joomla, select 'Home page slideshow' section. Select Upload images and browse your computer for your set of slideshow images. The slideshow will now display on your home page, before the main content area. Slideshow will automatically resize to the size of your images. To set a specific slideshow size, change Slideshow width and Slideshow height options. There are over 40 customizations available (including linking each slide to a url). Have fun, try them all! Follow in the footsteps of Harvard University and build your website upon the open-source platform, Joomla. Joomla image slideshows have become ever more popular since the birth of Joomla in 2005. You have great control over your website thanks to Joomla's Content Management System (CMS). Supported by a large community, Joomla has been downloaded over 50 million times and offers 1,000's of modules on its Joomla Extension Directory. 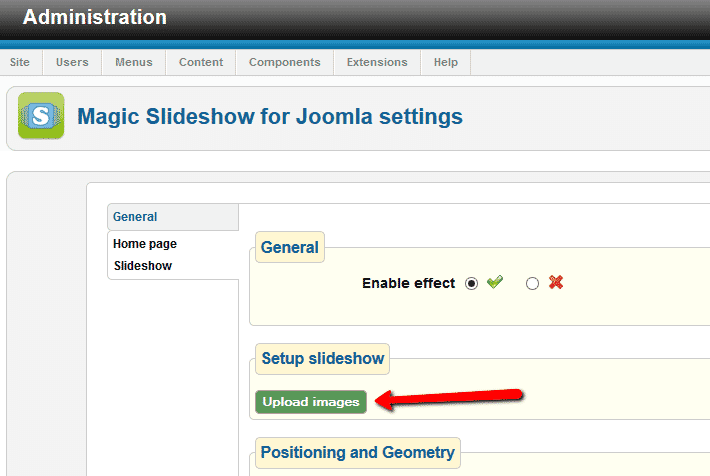 But how do you get this Joomla slideshow to appear in your article? That's easy, simply open your article and add a <div> tag with a class of MagicSlideshow – then place your images inside the <div>. The class is important because it connects the slideshow to your Settings page. 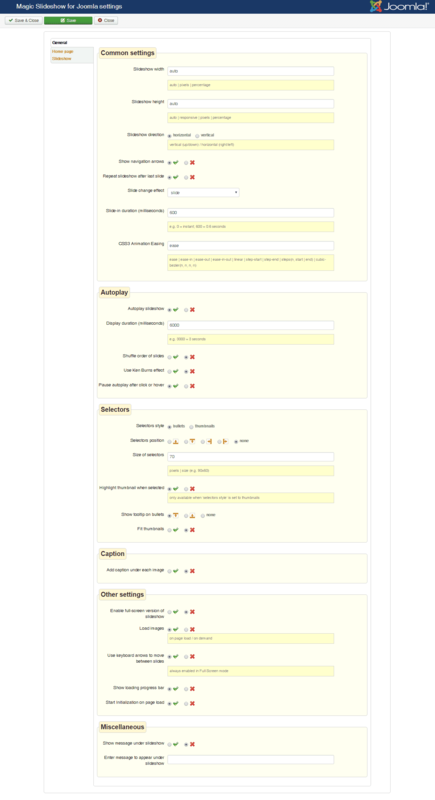 It's how you update any of your slideshows, from one easy area inside your Joomla admin area. What if you want one slideshow to appear different to other slideshows? No problem! You can manually add changes to any slideshow you wish to appear different. Use data-options= within the <div> code. By doing this you will have limitless options of how varied your Joomla slideshows can look. Grab any HTML code you need here & be inspired with a choice of combinations. If you think Magic Slideshow is just for images, think again. Can I add a slideshow to my homepage? Whether you're using a homepage slideshow, videos, Ken Burns for a pan & zoom effect, bullets to navigate, fading or slide transitions, linking to urls or going for a vertical slideshow instead of the traditional horizontal method, there are boundless opportunities to connect visitors with your content. And thanks to its responsiveness, this Joomla slider plugin fits perfectly on any device. Whether visitors are at their desk or on their mobile, Magic Slideshow automatically resizes for any screen size. As we mentioned, Joomla got even better with the launch of eCommerce solutions: HikaShop and VirtueMart. If you're using either platform, download the Magic Slideshow for HikaShop or Magic Slideshow for VirtueMart extensions (free trial). Thanks for trying Magic Slideshow on your Joomla site! What did you hope Magic Slideshow could do? How can we improve it? Let us know, we're always improving our tools based on customer feedback. Delete Magic Slideshow code from your content. Go to: Extensions > Plugin Manager > Disable plugin. 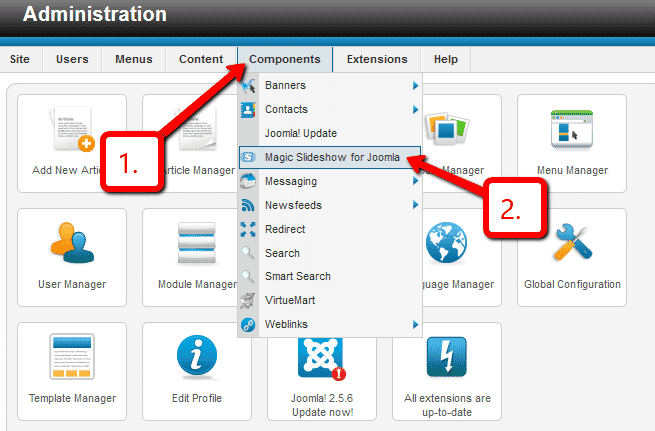 Go to: Extensions > Extension Manager > Manage > Add tick in box next Magic Slideshow for Joomla > Click 'Uninstall'. Magic Slideshow is now uninstalled. This extension was created for Joomla. 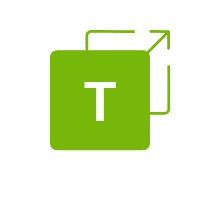 Use it to place an image slideshow on your product pages, category pages and other blocks such as 'bestsellers', 'recently viewed', 'newest'.